Increasingly, organizations are opting to migrate applications and data to the cloud. Done well, cloud migrations can yield numerous benefits, including lower costs, greater flexibility and enhanced disaster recovery. Done poorly, cloud migrations can reduce performance and put information at risk. 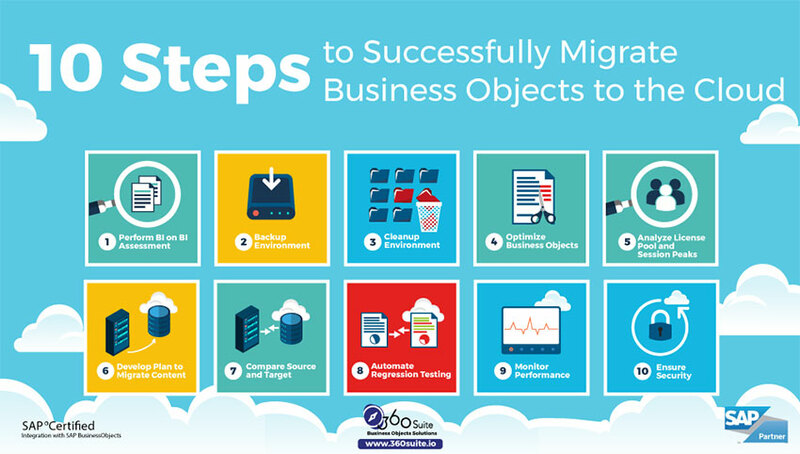 360Suite offers a set of solutions and recommends 10 steps to a successful Business Objects cloud migration. Shifting from on-premise servers to the cloud saves money on infrastructure and staffing. The cloud offers greater scalability because consumers can easily add CPU and RAM, and increase the number of servers. 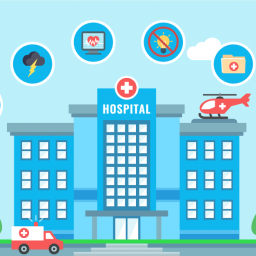 Cloud providers offer disaster recovery services that help protect data from being lost. But the cloud isn’t a one-size-fits-all solution. Organizations may be subject to regulatory requirements that dictate where information can be stored. Or they may be reluctant to give up full control over platform security, network latency, and data visibility. Geography is also a consideration, as global organizations may find the cloud limiting in terms of bandwidth and access to content in certain locations. Fortunately, a cloud migration isn’t an all-or-nothing proposition. Architecture refers to design structure; just as buildings vary by architecture, so does the cloud. In the full cloud model, Business Objects and all associated dependencies (Central Management Server (CMS), File Repository Server (FRS), Auditor, reporting, etc.) are hosted in the cloud. In the hybrid cloud model, the location of Business Objects and dependencies is split between on-premise servers and the cloud. Organizations should consider the impact of design choices before drawing up blueprints to migrate Business Objects to the cloud. Regardless of cloud architecture, 360Suite solutions reduce costs and shorten timelines by up to 80%, ensuring a cheaper, faster, easier and more successful cloud migration. Selecting the ideal cloud architecture and drawing up blueprints to move Business Objects to the cloud requires information that can only be obtained by analyzing the source platform. How many universes, objects and reports exist? How many are actively used? How many can be archived? How large are the reports? Are there unpurged reports? If so, how many? Are there duplicate reports with different names and/or locations? When do session peaks occur? Is it necessary to migrate entire inboxes, including unread documents? Who is connecting and how often? Who is not connecting? Who are the power users and how do they use Business Objects? How many instances can be archived or deleted? Are there document scheduling jobs? Check the destination folder locations; are they still valid? How many data sources exist and are they all in use? Who uses what client tools? Are they on-premise or hosted? Business Objects has limited BI on BI capability via the admin cockpit, and the Business Objects query builder does not query the FRS. In contrast, 360Suite generates detailed information needed for a thorough BI on BI assessment. It queries the CMS, the FRS and Auditor across all environments to obtain data on utilization, duplication, security, variables and functions regardless of source data (unv, unx, BEx query, Freehand SQL, etc.). This information provides a unique and complete picture of the source platform. Backing up the current environment before migrating Business Objects to the cloud safeguards the process. Business Objects deals in large, inflexible Business Intelligence Archive Resource (BIAR) files comprised of many objects. A typical Business Objects recovery strategy includes backing up the entire Business Objects server and CMS database. This allows the full system to be restored in the event of a server crash, but it is not suitable for selective rollbacks or for restoring individual deleted objects. It also fails to address corrupted environments–if an environment is corrupted, so too is the mirrored backup! Finally, full backups may impact platform availability and take down environments for several hours. 360Suite includes a powerful and flexible backup solution that creates one BIAR file per object. The first time 360Suite runs, it performs a full backup. Every night thereafter, 360Suite runs delta and dynamic backups, which have low impact on the platform. Incremental backups enable selective rollbacks to previous versions of any object (personal documents, security settings, user, universe connections, etc.) at any time. Recovering at the object level gets corrupted environments up and running in minutes. 360Suite also includes a recycle bin from which any deleted object can be recovered, unlike the Business Objects recycle bin, which cannot recover some objects (e.g., users). Investing time and energy into cleaning up the environment yields high returns. That’s because less content results in easier, faster and cheaper Business Objects cloud migrations. 360Suite provides solutions to optimize the environment by streamlining content. Not only does 360Suite identify unused or duplicated content, it also empowers the Business Objects Administrator to act quickly on the findings and reduce content, typically by 40-60%. 360Suite can promote, delete or archive content in bulk, whereas Business Objects has limited capacity to do so. Reducing the number of recurring instances before a migration saves bandwidth, and therefore money, down the road. Optimizing Business Objects is another way to reduce content. 360Suite tunes up SAP BusinessObjects Webi reports through query stripping, which detects useless variables and universe objects. Query stripping is particularly useful for Webi reports that contain hundreds of variables and numerous data sources. Improving the efficiency of reports reduces data space (often by 30%), which lowers data transfer costs. Eliminating bugs in reports reduces regressions and paves the way to a smooth cloud migration. Without 360Suite, efficient and effective query stripping is nearly impossible. Another way to optimize Business Objects is to send schedules and publications within the Business Objects environment in native format, rather than externally to email as PDF or Excel files, which take up more space. 360Suite makes this possible. Finally, 360Suite provides a way to bulk update recurring instances, eliminating the need to manually change each schedule job. Export the list of recurring instances to Excel and update the local destination to the new destination. Then import the updated Excel file to bulk update your recurring schedules. Analyzing the license pool and session peaks before migrating Business Objects to the cloud highlights potential cost savings. That’s because renewing unnecessary licenses or opting for the wrong license model wastes resources. So does maintaining peak server capacity when it’s not needed. 360Suite provides valuable information about the historical use of Named User Licenses (NUL) and Concurrent Sessions (CSBL). Prebuilt Webi reports highlight needs and trends for the purpose of optimizing licensing pools—adding, renewing or ending licenses. 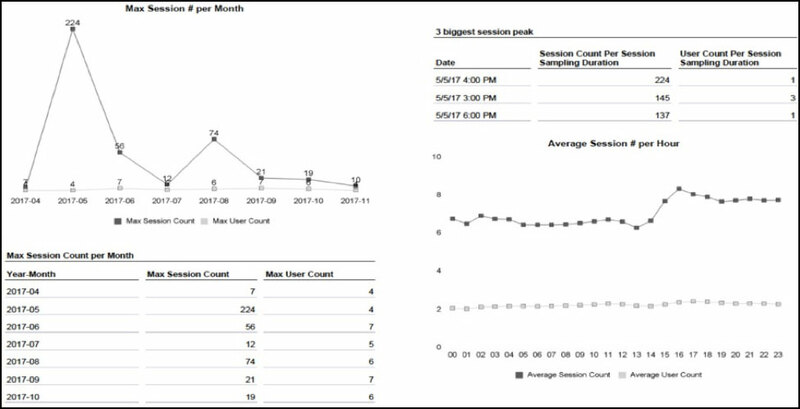 360Suite also provides valuable information about server use over time. Prebuilt Webi reports highlight peaks for the purpose of optimizing server utilization—switching servers off when not needed or reducing capacity during off-peak hours. Analyzing the license pool and session peaks without 360Suite is like looking for a needle in a haystack. Migrating Business Objects to the cloud is challenging without a good promotion strategy. Lifecycle management capabilities can be limited, especially for large promotions. By creating one BIAR file per object, 360Suite enhances the flexibility of Business Objects and promotes large content with ease. By flagging and scheduling promotions, 360Suite takes a challenging process and makes it transparent. Migrating Business Objects to the cloud raises the problem of how to handle content created or modified during the migration process. 360Suite gathers information from the entire Business Objects landscape and takes deployment snapshots before, during and after a migration. This eliminates the need to freeze the source production environment during the migration process or to attempt to synchronize the source and target. By comparing snapshots and highlighting changes (deleted, modified or new content), 360Suite takes the guesswork out of the process and ensures that all content (security, metadata, universe content, etc.) migrates completely and correctly. Regression testing is the most time-consuming part of a migration project. It is also the most important part, because end-users must rely on the new outputs. Regression testing is particularly important when migrating Business Objects to the cloud because a cloud migration project is normally initiated by IT, and must be accomplished without adversely impacting business units. Business Objects often manages sensitive data (financial, medical, personal), which is subject to regulatory requirements, including the need for regression testing that cannot be outsourced. 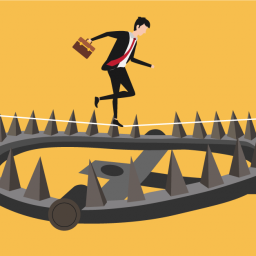 Done manually, regression testing is tedious and risky. 360Suite automates wide-scale regression testing for faster and safer migration of Business Objects to the cloud. When testing identifies regressions, 360Suite performs impact analyses to pinpoint affected objects, and bulk updates reports. Finally, 360Suite keeps track of the migration process to ensure due diligence. A major concern in cloud migrations is performance, and whether it matches or surpasses the same deployment on premise. 360Suite compares execution times of identical reports run on-premise and in the cloud to identify performance issues. 360Suite HTML 5 live monitoring also helps the BOBJ administrator troubleshoot the issues to identify the source(s) and develop a remediation plan. Business Objects lacks tools to monitor execution times, making 360Suite the obvious solution. A recent white paper explains how 360Suite extends the reach of performance testing software to all components of the Business Objects platform and generates crystal-clear outputs needed to ensure an optimal end-user experience at the lowest possible cost. Cloud migrations are a good time for Chief Security Officers and managers to review security and regulatory requirements, which may include storing information in a particular location or maintaining specific security protocols. 360Suite also identifies data that is impacted by regulatory requirements so administrators can monitor and audit sensitive information during the cloud migration process. 360Suite by GB&SMITH is a set of solutions that facilitates the migration of SAP BusinessObjects to the cloud. 360Suite allows organizations to maintain control of platforms on a daily basis, which ensures a better experience for SAP BusinessObjects users and maintains readiness for future migrations.